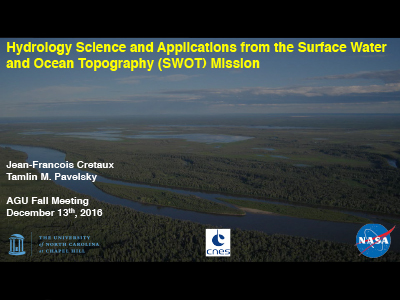 The Surface Water and Ocean Topography (SWOT) satellite mission is a joint project of NASA and CNES, the French space agency. It aims to provide the first simultaneous, space-based measurements of inundation extent and water surface elevation in rivers, lakes, and wetlands around the world. Although the orbit repeat time is approximately 21 days, many areas of the earth will be viewed multiple times during this window. SWOT will observe rivers as narrow as 50-100 m and lakes as small as 0.01-0.06 km2, with height accuracies of ~10 cm for water bodies 1 km2 in area. Because SWOT will measure temporal variations in the height, width, and slope of rivers, several algorithms have been developed to estimate river discharge solely from SWOT measurements. Additionally, measurements of lake height and area will allow estimation of variability in lake water storage. In this introductory presentation, we will discuss SWOT's capabilities and the science questions that it will aim to address.